It is common in marketing, or at least in marketing surveys, to ask if a product or service exceeded expectations. This means the product or service went above and beyond what the customer was anticipating. When you get the service you expect that just means the company is doing okay but is not outstanding. When you get less than you expect you complain or at least do not return to that company. This book is one that I should return. 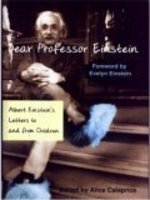 Promoted as letters from children to Einstein and his responses gets it only half right. There are letters from children, but only thirteen responses. Some of the responses do not have a letter, but at least one can guess the content. The first one hundred ten pages of two hundred thirty two, consists of a quick biography and photos of Einstein’s life. Subtracting the afterword, suggested further reading, and index, the book has one hundred pages of letters. Even scarier is the suggested retail price is $25.99. at least Amazon sells it for $19.37. A better price would be $9.67, half of Amazon’s price, fitting for the half of the book that is actually correspondence. I have two heroes in my life, Mickey Mouse and Albert Einstein. Mickey reminds me to not take things to seriously and Albert reminds me to question everything. With that in mind, I question why I bought this book, but have to laugh at myself for wasting the money.